In the design of a reinforced concrete beam subjected to bending it is accepted that the concrete in the tensile zone is cracked, and that all the tensile resistance is provided by the reinforcement. The stress that may be permitted in the reinforcement is limited by the need to keep the cracks in the concrete to acceptable widths under working conditions, thus there is no advantage to be gained from the use of the very high strength steels which are available. The design is therefore uneconomic in two respects: (I) dead weight includes 'useless' concrete in the tensile zone, and (2) economic use of steel resources is not possible. 'Prestressing* means the artificial creation of stresses in a structure before loading, so that the stresses which then exist under load are more favourable than would otherwise be the case. Since concrete is strong in compression the material in a beam will be used most efficiently if it can be maintained in a state of compression throughout. 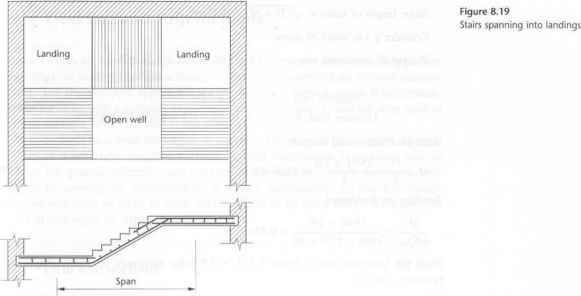 Provision of a longitudinal compressive force acting on a concrete beam may therefore overcome both of the disadvantages of reinforced concrete cited above. Not only is the concrete fully utilised, but also the need for conventional tension reinforcement is removed. The compressive force is usually provided by tensioned steel wires or strands which are anchored against the concrete and. since the stress in this steel is not an important factor in the behaviour of the beam but merely a means of applying the appropriate force, full advantage may be taken of very high strength steels. 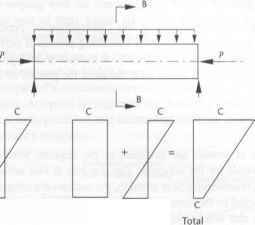 The way in which the stresses due to bending and an applied compressive force may be combined is demonstrated in figure 11.2 for the case of an axially applied force acting over the length of a beam. The stress distribution at any section will equal the sum of the compression and bending stresses if it is assumed that the concrete behaves clastically. Thus it is possible to determine the applied force so that the combined stresses are always compressive. By applying the compressive force eccentrically on the concrete cross-section, a further stress distribution, due to the bending effects of the couple thus created, is added to those shown in figure 11.2. This effect is illustrated in figure 11.3 and offers further advantages when attempting to produce working stresses within required limits. Early attempts to achieve this effect were hampered both by the limited steel strengths available and by shrinkage and creep of the concrete under sustained compression, coupled with relaxation of the steel. This meant that the steel lost a large part of its initial pretension and as a result residual stresses were so small as to be useless. It is now possible, however, to produce stronger concretes which have good creep properties, and very high strength steels which can he stressed up to a high percentage of their 0.2 per cent proof stress are also available, for example, hard-drawn wires may carry stresses up to about three times those possible in grade 500 reinforcing steel. This not only results in savings of steel quantity, but also the effects of shrinkage and creep become relatively smaller and may typically amount to the loss of only about 25 per cent of the initial applied force. Thus, modern materials mean that the prestressing of concrete is a practical proposition, with the forces being provided by steel passing through the beam and anchored at each end while under high tensile load. Two basic techniques arc commonly employed in the construction of prcstressed concrete, their chief difference being whether the steel tensioning process is performed before or after the hardening of the concrete. The choice of method will be governed largely by the type and size of member coupled with the need for precast or in situ construction. In this method the steel wires or strands are stretched to the required tension and anchored to the ends of the moulds for the concrete. The concrete is cast around the tensioned steel, and when it has reached sufficient strength, the anchors are released and the force in the steel is transferred to the concrete by bond. In addition to long-term losses due to creep, shrinkage and relaxation, an immediate drop in prestress force occurs due to elastic shortening of the concrete. These features are illustrated in figure 11.4. What is eccentric prestressing ? Why eccentricity of wire is provided in prestressed concrete? Why tendon provided with eccentricity? What is the effect of eccentric prestressing? What is eccentric pre stressing? What is eccentricity in prestressing? How to calculate ecentricity of prestresed concrete? What is eccentricity for prestress concrete? Why prestressing wire are placed at an eccentricity? What is escentricity in concrete? 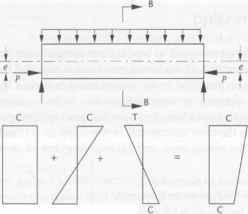 What is the effect of an eccentricity prestressing force at a section? What is the ecentricity in prestressed concrete showing by figure? Why we need eccentric tendons in prestressing concrete? What is ecentricity and effect of ecentricity and type of ecentricity? Why we have to provide eccentricity for the tendons? What is eccentricity of prestress concrete structures? Why eccentricity is provided in steel structure? What do you mean by eccentric prestress? How to find eccentricityin concrete beam? How to calculate ecentricity in prestess concrete? How to find eccentricity in prestress if eccentricity at end and at mind is given? What is eccentricity in dedign concrete? What is the effect of eccentric prestressing force of a section? What are the effects of eccentricity on prestressed concrete? How is eccentricity calculated in case of prestressed concrete? How to calculate eccentricity of beams? How to calculate stress due to eccentricity? How to find eccentricity in prestressed section? Why is the eccentricity zero when calculating stresses? What is eccentric pre tensioning beam?